Hugo Rafael Chávez Frías (July 28, 1954 – March 5, 2013). Today, I would rather celebrate the majority of Venezuelans -- especially the poor and the marginalized. It is, after all, the people who made Chavez, and not the other way around. And it is the humble people of Venezuela who saw to it that Chavez was allowed to complete this many years as president, after all. 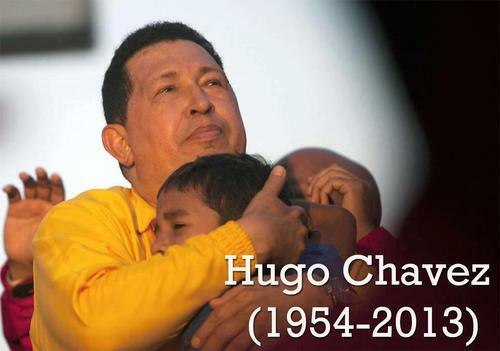 Chavez came very close to dying much earlier -- of unnatural causes. It was People Power that kept him alive and that kept his democratically elected government in power. I'm referring of course to the April 2002 coup d'etat cynically aided and abbetted by Venezuela's rabidly right-wing media and which was issued with an immediate stamp of approval by the Bush administration. It's important to remember that the traditional elite of Venezuela -- the oiligarchs of this South American petrostate who ruled for decades under the 'Washington Consensus,' and who quashed resistance to neoliberalism in blood like during the 1989 caracazo -- and their allies abroad in the U.S. government and in the corporate boardrooms of the world never intended for Hugo Chavez to live beyond those days in April 2002. If the people had not mobilized to restore Chavez to power 11 years ago, Latin America would be a much worse place today. The "pink tide" would likely have been largely stemmed before it had a chance to spread; transformations that have begun in Bolivia and Ecuador might never have gotten out of the gates. Who knows, the FTAA, that continental corporate trade deal, might have been implemented rather than soundly defeated. After all, back in 2001, when tens of thousands marched in Quebec City against the early stages of the FTAA, President Chavez was almost alone as a head of government inside the talks opposing the deal. Whatever the shortcomings and all the very real contradictions of Chavez's government, the poor of Venezuela and of all Latin America are better off today in real and tangible ways because the people kept it in power.